The GV-Backup Center program provides you with a secure and affordable remote backup solution for the GV-System, GV-VMS, GV-Recording Server and GV-IP Devices. The GV-Backup Center can automatically store a copy of recordings and logs to the offsite location. If a disaster strikes where the GV-System, GV-VMS, GV-Recording Server or GV-IP Devices are located, the recording data remain safe in a different location. The following is minimum system requirements for the server to run the GV-Backup Center. Note: GV-Backup Center has ended support for Windows XP and Windows Vista. The server's backup speed and transmitting capacity vary depending on the number of Gigabit connections. The number of Gigabit network cards required to receive 200 GV-IP Devices and to support remote access of backed up data are listed below according to the resolution of the source video. Also note the maximum number of hosts supported by a single hard disk to calculate the number of hard disks required. When GV-Backup Center connects with GV-Recording Server, it will back up the recordings of all the channels connected to the GV-Recording Server. 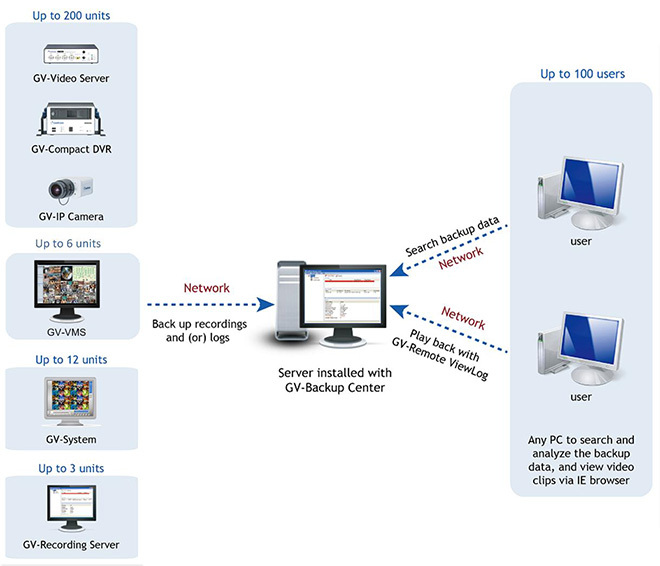 Each GV-Backup Center supports up to 3 units of GV-Recording Server, with each GV-Recording Server being connected under an independent LAN. To back up all 128 channels of recordings from GV-Recording Server, it is recommended to install the following number of hard disks in the GV-Backup Center, in addition to the 1 hard disk used for installing GV-Backup Center. The results were obtained using SATA3 hard disks with an average write speed of 100 MB/s. The results were obtained with video clip time set to 5 minutes. If the time required to transfer all files exceeds the clip time, file transferring to GV-Backup Center may not be able to keep up with recording. To back up the recordings of 128 channels, it is required to meet the maximum bit rate supported by the GV-Recording Server and the maximum number of channels assigned to a single hard disk in the GV-Recording Server. To back up the recordings with full 30 fps, it is required to meet the maximum number of channels supported by the GV-Recording Server and the maximum number of channels assigned to a single hard disk in GV-Recording Server. When GV-Backup Center connects with GV-VMS, it will back up the recordings of all the channels connected to the GV-VMS. Each GV-Backup Center supports up to 6 units of GV-VMS, with each GV-VMS being connected under an independent LAN. Except the following non-compatible IP Devices, the above mentioned GeoVision software, GeoVision IP cameras, Video Servers and Compact DVR all support GV-Backup Center.